Also serving communities of Hardy. There are 18 Assisted Living Facilities in the Roanoke area, with 16 in Roanoke and 2 nearby. The average cost of assisted living in Roanoke is $3,450 per month. This is higher than the national median of $3,346. Cheaper nearby regions include Salem with an average starting cost of $1,950. To help you with your search, browse the 90 reviews below for assisted living facilities in Roanoke. On average, consumers rate assisted living in Roanoke 4.1 out of 5 stars. Better rated regions include Salem with an average rating of 4.2 out of 5 stars. Caring.com has helped 7 families in Roanoke find high-quality senior care. To speak with one of our Family Advisors about assisted living options and costs in Roanoke, call (855) 863-8283. Located in the Blue Ridge Mountains, Roanoke, Virginia is a municipality of over 300,000 residents with a number of smaller surrounding cities. The city is known for its natural beauty, making it an ideal place for active seniors to enjoy a walk or drive through breathtaking vistas. There are 17 assisted living facilities in the area, all of which are licensed and regulated by the Virginia Department of Social Services. Weather in Roanoke, Virginia, follows four distinct seasons. Winter temperatures drop as low as 28 degrees, while summer highs hover in the upper 80s. The rest of the year is considered pleasant, light-jacket weather for senior residents. The air quality in Roanoke is usually good throughout the year, as it is against the Blue Ridge Mountains of Appalachia, which tends to filter out much of the pollution from the city. However, sometimes there is pollen in the air, which could cause breathing difficulties for seniors with respiratory issues. According to Sperling's Best Places, Roanoke has an overall cost of living totaling 87 out of 100, which is lower than the state (107) and national (100) averages. This is due to a lower average housing cost of $144,600 in the area. Necessities like groceries, transportation and utilities are also well below the state and national averages, meaning seniors won't spend as much on a daily basis. Roanoke’s crime rate is quite high for a city of its size, with its violent crime average at 4.18 per 1000 people. This is nearly double the state average of 2.18 and slightly higher than the national average of 4. Consequently, Roanoke is considered safer than just 7 percent of American cities, something seniors should take into consideration. RADAR is a non-profit group that has been providing transportation for seniors, among others, in the Greater Roanoke Valley over the past 40 years. They have partnered with other city and county transit services to give discounted rides to seniors all over the metropolitan area. The Roanoke area is home to world-class medical facilities, including the Carillion Roanoke Memorial Hospital, in the event of medical emergencies or illness. Assisted Living costs in Roanoke start around $3,450 per month on average, while the nationwide average cost of assisted living is $4,000 per month, according to the latest figures from Genworth’s Cost of Care Survey. It’s important to note that assisted living rates in Roanoke and the surrounding suburbs can vary widely based on factors such as location, the level of care needed, apartment size and the types of amenities offered at each community. 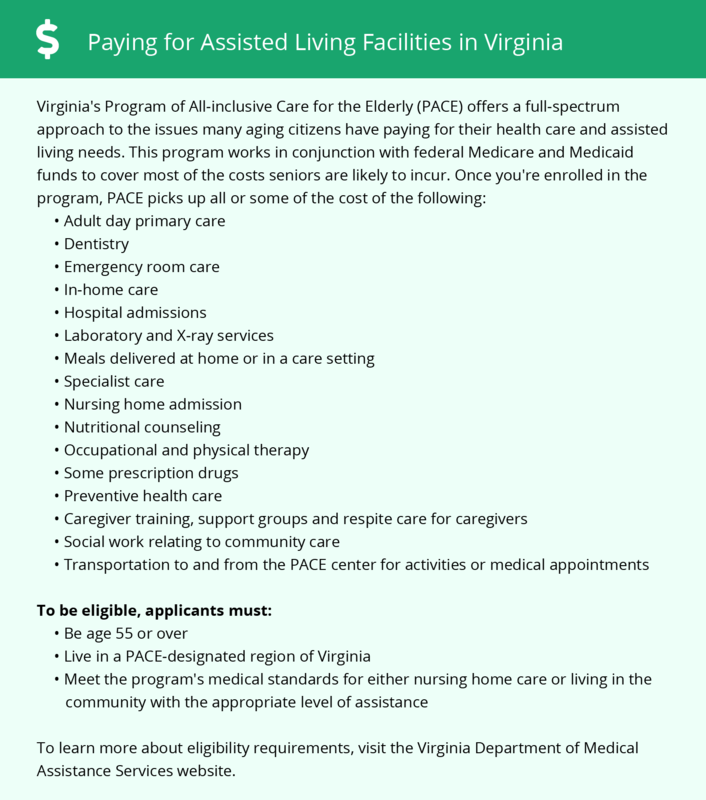 The state of Virginia has an Auxillary Grant to help offset the costs of assisted living. There is also an Alzheimer’s Assisted Living Waiver to Medicaid that will pay for assisted living facilities to those who are 55 years or older and are suffering from Alzheimer’s or a related form of dementia. Roanoke and the surrounding area are home to numerous government agencies and non-profit organizations offering help for seniors searching for or currently residing in an assisted living community. These organizations can also provide assistance in a number of other eldercare services such as geriatric care management, elder law advice, estate planning, finding home care and health and wellness programs. To see a list of free assisted living resources in Roanoke, please visit our Assisted Living in Virginia page. Roanoke-area assisted living communities must adhere to the comprehensive set of state laws and regulations that all assisted living communities in Virginia are required to follow. Visit our Assisted Living in Virginia page for more information about these laws.